KAMPUNG Baru took shape in the late 19th century on 227 acres next to the Klang River just outside Kuala Lumpur. It was one of the projects by the British administration. The main objective, says historian and academician Tan Sri Prof Khoo Kay Kim, was to provide a place near the town centre where the Malays could live quite cheaply. 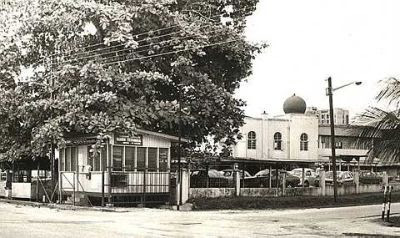 By Jan 12, 1900, the Selangor Resident gazetted the area as Malay Agricultural Settlement. Rules were drawn up by the Resident under the Land Enactment 1887 to manage the area and to keep the settlement entirely Malay. The Rukun Tetangga building just outside Masjid Jamek Kampung Baru in a picture taken in 1982. The British thought that by building a village setting, they would be able to induce them to come to cultivate paddy. But the ones who came were not the ones who wanted to cultivate the land. They were mainly traders. And because they did not want to leave their village environment, they did not work in the mines or estates. The land was said to be “partly high flat land and partly swamp” which accounts for the presence of crocodiles. It was also prone to floods. In the early days, each occupant held about quarter of a hectare. Among the first to take advantage of the place were the peons and messengers employed in government offices. The bullock cart drivers, mainly from Malacca, also arrived, followed subsequently by Javanese and Sumatrans. At that time, transport was crucial. Already, the Malays were rowing the sampans up and down the Klang River to transport goods to take to the interiors for the miners, who were predominantly Chinese. Gradually, that mode of transport died when the railway arrived in 1886. By 1912, buses and lorries came. The first car came at about 1900. Although the settlement grew in terms of population, there were problems with sanitation and other issues. The population grew by a third in five years from 2,600 in 1928 to about 3,500 in 1933. Along with this growth, land ownership became increasingly fragmented. From the initial 196 holdings in 1904, there are today 1,792 lots comprising both Malay Agricultural Settlement and the Non-Malay Agricultural Settlement land like the Dang Wangi and Chow Kit area. From a purely agricultural settlement where land is accounted for in terms of lots, there are today strata titles because low-rise and high-rise exist together with traditional Malay houses.